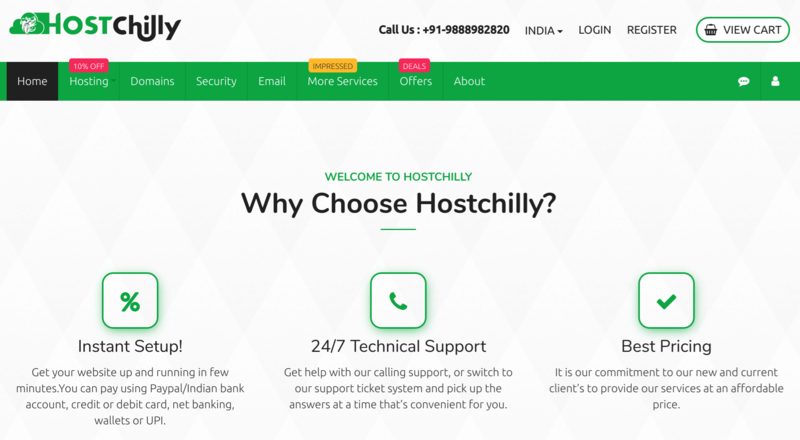 Hostchilly Review 2019: Is Hostchilly a Good Hosting? Indian web host Hostchilly offers a straightforward set of super-cheap SSD shared hosting and VPS plans. Hostchilly was established in 2017 by Hostchilly IT Solutions group. It’s based in Punjab (India), and it offers a variety of web hosting and VPS plans along with domain registration and SSL certificates. The company also provides an automated website backup solution with CodeGuard. Hostchilly’s main website is in English, and – in common with many hosting providers – its support site can be switched into 25 additional languages. Hostchilly offers four SSD shared hosting plans – Mini, Economic, Business, and Ultimate – which differ in terms of disk space (10-300 GB), bandwidth (100 GB-unlimited), the number of websites you can host (1-unlimited), and the number of subdomains and email accounts (2-unlimited for both). You also get DDoS protection (to safeguard your network against distributed denial-of-service attacks) and an inbuilt CDN service (to make your website load many times faster). In addition to its shared hosting offerings, Hostchilly also offers four reseller hosting plans, four cloud VPS plans, and four “DMCA ignored” hosting plans. The VPS plans provide full root access so you can access your server via SSH to perform tasks such as upgrading the operating system, restoring databases, or installing packages. Hostchilly’s shared hosting plans are dirt cheap, even with 18% VAT added, and you can often get them even cheaper by checking out the promotional codes on the company’s ‘offers’ page. At the checkout, you can upgrade some of the free features – such as the SSL certificate, SiteLock security, and CodeGuard backups – to enhanced paid versions. Plans are payable in EUR/GBP/INR/USD on monthly, quarterly, semi-annual, annual, biennial, and triennial billing cycles by PayPal, credit/debit card, NEFT transfer, and various Indian payment gateways. Hostchilly offers a 15-day money-back guarantee that gives you two weeks to decide if this really is the host for you. You can claim your refund by sending an email or submitting a support ticket, but the refunded amount will be subject to certain reductions such as installation fees, custom software license fees, or the real cost of your free domain (if any). 24/7 technical support can be accessed by telephone or the ticket system (from the customer control panel). Unfortunately, I received no response when I tried an email approach as a prospective customer. In summary, it’s worth checking out Hostchilly if you’re looking for cheap-but-reliable SSD shared hosting and VPS plans. For cheap SSD shared hosting plans, check out Hostchilly. Wondering how Hostchilly stacks up against other Web Hosting companies? Enter any other Web Hosting company and we will give you a side-by-side comparison.